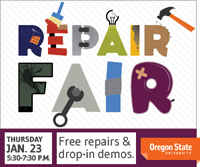 Repair Fair Thurs. Jan. 23: Get your fix! If it’s broke, fix it! Do so by coming to the Recycling Warehouse at 644 SW 13th Street on Thursday, January 23rd between 5:30 and 7:30 pm for our January Repair Fair. Bring your broken items and questions and volunteers will help you learn how to repair your things, and drop-in DIY (do it yourself) demos to learn repair skills (see list below for what’s on offer this time)! Save money, save natural resources. Free and open to all. A volunteer shows how to darn a holey sock. Click to view larger. 6:45 to 7:15 pm: Make Your Own Used T-Shirt Bag – Drop by the Clothing repair station to learn how to reduce waste by making an old T-shirt into a reusable bag using a quick and easy no-sew technique! Leave with your very own reusable shopping bag along with the know-how to make more at home. All supplies provided, but feel free to bring your own shirt if you have one you’d like to use. (Leader: Andrea Norris, Marketing & Development Coordinator for Campus Recycling). For more details such as directions and the date of our February Repair Fair, visit our website and/or join the event on Facebook.